Imprint: Decoration not included in price. Classy, sophisticated, fun, stylish. These are just some of the words that come to mind when we see the Ladies Silk Touch Performance Polo in action. Imagine yourself bringing the kids to the shops in the morning, then turn around for a game of golf with your girlfriends and finally finish off the day spending quality time with your family. The Ladies Silk Touch Performance Polo fits all of these requirements, what with its smooth texture and high performance quality. The Ladies silk touch performance polo comes in many different colour choices, allowing the customer to suit their style by their preference of season, month, weather etc. These colours include: Black, Bright Purple, Brilliant Blue, Carolina Blue, Dark Green, Lime, Maroon, Navy, Neon Orange, Neon Yellow, Pink Raspberry, Red, Royal, Steel Grey, Teal Green and White. It weighs 3.9 ounces and is made from a 100% cationic polyester double knit feature. It also features a gently contoured silhouette. The style of collar is a V-neck Johnny collar which gives it a distinct feminine touch. This also has a tag-free label which enables a soft touch off the silk fabric for a delicate feel to the skin. There are also set in, open cuff sleeves to rid of any sense of congestion when either indoors or outdoors. Also featuring is a double-needle sleeve cuffs and hem. We took our legendary Silk Touch™ Polo and made it work even harder. The durable Silk Touch™ Performance Polo wicks moisture, resists snags and thanks to PosiCharge™ technology, holds onto its colour for a professional look that lasts. 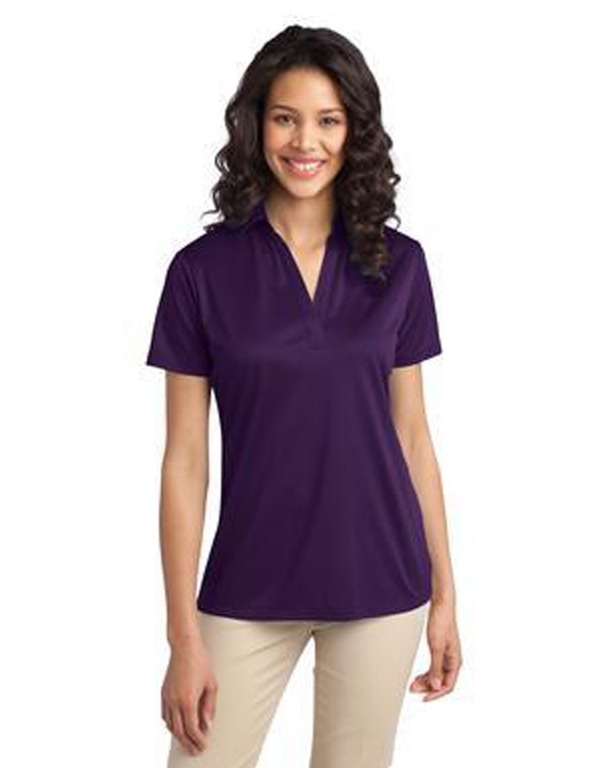 The Ladies Silk Touch™ Performance Polo comes in ladies sizes ranging from XS-4XL, accommodating any boy size and type. This polo will allow the wearer to enjoy their day, be it in for leisure, business, travel etc. You can now achieve this thanks to the relaxing environment created by the soft feel of the silk touch performance polo. On a day to day basis, people look to improve themselves in every walk of life. So, why not try the Silk Touch™ Performance Polo for its ability to ensure maximum comfort and performance. © 2013 Paragon Promo Apparel, All Rights Reserved.